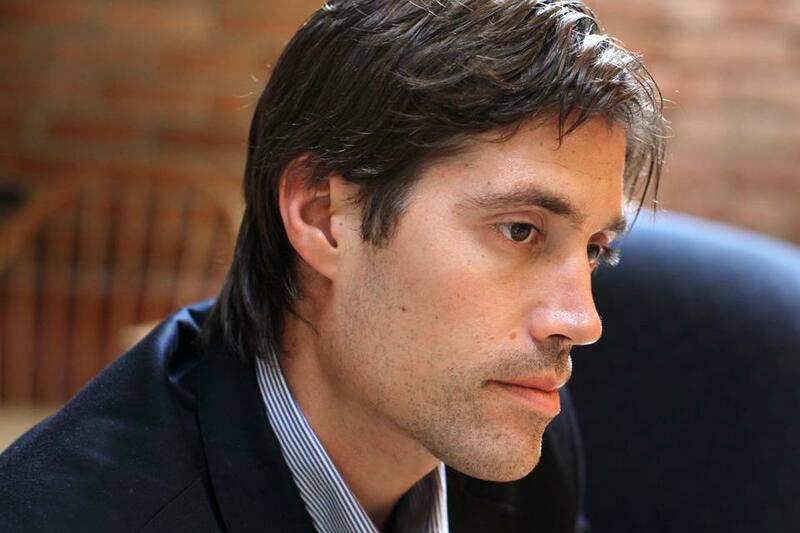 James Foley was reportedly intercepted in 2012 as he was traveling toward the Turkish border. James Foley, a freelance war correspondent from New Hampshire, was killed at the hands of the Islamic State militant group, which distributed a video that said the apparent beheading was retaliation for recent US airstrikes in Iraq, US officials said late Tuesday. The officials told the Associated Press that they believe it is Foley in the video, bringing to a tragic end a saga that began when Foley was kidnapped in Syria in November 2012. It is unclear when the video was made or where it was taken. In the video, a man who appears to be Foley is seen kneeling in a barren landscape. Behind him stands a masked member of the Islamic State group, who is clad in black and wields a knife. Speaking in a monotone, under evident duress, Foley says that his death comes in retaliation for the recent airstrikes. President Obama ordered the bombings against Islamic militants who had occupied parts of Iraq over the summer. Foley also directly addresses his brother, John, a member of the Air Force, and urges him to consider the ramifications of the bombing campaign. The militant fighter standing over him then says the airstrikes are denying the rights of Iraqi Muslims to live under an Islamic caliphate. The militant says that the life of another US journalist, Steven Sotloff, hangs in the balance. 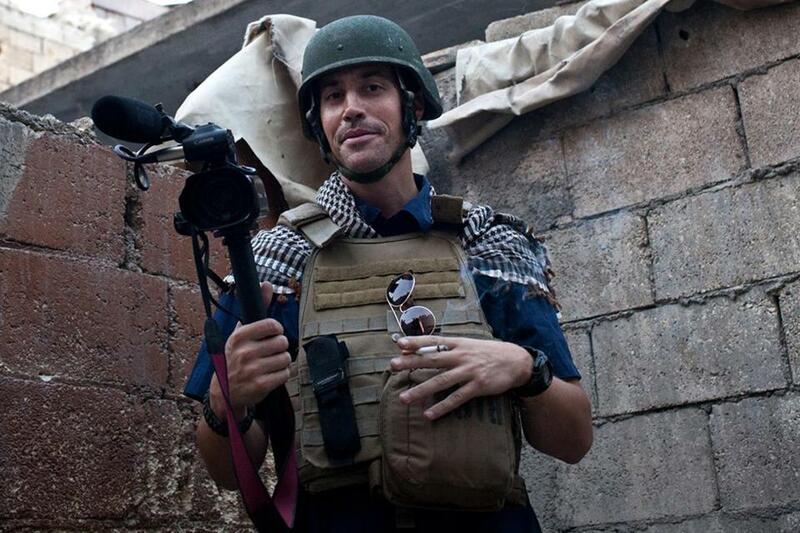 James Foley, 40, had reported on conflicts in Afghanistan, Iraq, and Libya. Sotloff, who has covered the region for Time and Foreign Policy magazines, among other outlets, was last seen reporting in Aleppo, Syria, last year. A man identified as Sotloff appears at the end of the video. The militant says his fate would depend on what Obama does next — a threat that was widely interpreted as referring to the US airstrikes. Both prisoners in the video are wearing orange shirts and pants, similar to orange jumpsuits worn by detainees at the US military prison at Guantanamo Bay, Cuba. In January 2013, Foley’s family spoke publicly of his abduction in Syria, which they said occurred on Thanksgiving Day in 2012. He was traveling toward the Turkish border when he was intercepted by an unmarked car, according to a story published by GlobalPost after his abduction. The company’s chief executive, Philip S. Balboni, issued a statement Tuesday evening. “On behalf of John and Diane Foley, and also GlobalPost, we deeply appreciate all of the messages of sympathy and support that have poured in since the news of Jim’s possible execution first broke,” Balboni said of Foley’s parents. The statement was on the outlet’s website. Charles Sennott, cofounder of GlobalPost, said on Tuesday night that he was holding out hope for a positive outcome. By late Tuesday, however, New Hampshire officials and others were resigned to the likelihood that Foley was dead. “A talented and fearless photojournalist, James Foley brought us images that connected us to events across the globe, illuminating stories of both heartache and hope and helping us better understand the world we all share,’’ New Hampshire Governor Maggie Hassan said in a statement. Foley, 40, had reported on conflicts in Afghanistan, Iraq, and Libya, where he was taken captive in April 2011 by forces loyal to Libya’s leader, Moammar Khadafy, while on assignment for GlobalPost. Foley and two other journalists spent 44 days in Libyan prisons before being released, the organization said. Outside the home of Foley’s parents Tuesday night in Rochester, N.H., a faded yellow ribbon encircled a tree at the edge of the driveway. People entering and leaving the two-story house, including a priest, declined to speak to reporters. The tactic of showing the murder of Westerners is reminiscent of Al Qaeda in Iraq, the group’s forebear, which beheaded a number of journalists and contractors in Iraq between 2004 and 2007. Another explanation, the former official said, “is they are feeling the heat” from the airstrikes. Sunni extremists from the Islamic State group have occupied Tikrit and the northern city of Mosul since early June and large parts of the country’s north and west. The militant onslaught has plunged Iraq into its worst crisis since the withdrawal of US troops in 2011. The group since has declared a self-styled caliphate in territory it controls in Iraq and neighboring Syria, imposing their own harsh interpretation of Islamic law. Some 1.5 million people have been displaced by fighting in Iraq since the Islamic State’s rapid advance began in June, and thousands more have died. Material from the Associated Press was used in this report. Peter Schworm of the Globe staff and Globe correspondent Jeremy C. Fox contributed. Travis Andersen can be reached at travis.andersen@globe.com. Bryan Bender can be reached at bryan.bender@globe.com.